Win McNamee/Getty ImagesSpeaker of the House Paul Ryan (R-WI) speaks with members of the House Republican leadership following their weekly policy meeting June 14, 2016 in Washington, DC. House Speaker Paul Ryan declined to rule out a potential future White House bid Thursday, explaining in an interview that he doesn’t currently have “presidential-sized personal ambitions” but conceding that could change later in life. The remarks came in a sit-down interview with The Huffington Post that was published online Friday. “Do you have any interest in being president one day?” a reporter asked. “I’ve passed on it 2012, I passed on it in 2016. If I was that ambitious, I would have run by now,” the Wisconsin Republican replied. “So you don’t see yourself taking that jump?” the reporter pressed. “I don’t know. 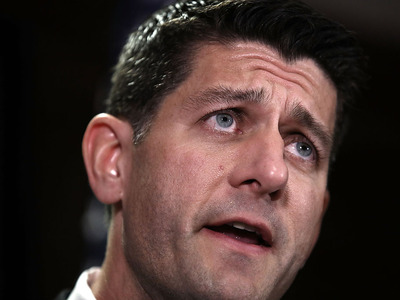 I don’t know the answer to that question,” Ryan said. Ahead of the 2016 cycle, there was much speculation about Ryan jumping into the race. When Donald Trump seized the GOP nomination, Ryan was floated by Republicans opposed to Trump’s candidacy as someone whom delegates could possibly agree to nominate at the convention through a change in rules. Ryan, for his part, repeatedly said he was not interested in running for president in 2016.